Pet rabbits have increased greatly in popularity the last twenty years. As a sad consequence domestic rabbits are estimated to be the third most often abandoned pet following cats and dogs. Most of these abandoned rabbits die an early and painful death. Those that do survive will sometimes breed and develop into large colonies of domestic rabbits. The colonies of feral or “community rabbits”, live a harsh life, suffer from illnesses, are traffic fatalities and often draw predators to public areas. Cities often declare the rabbits as a nuisance and opt to have them exterminated. Rabbits are mostly silent beings that have little attention drawn to their plight. My goal is to raise money that has the potential to visually speak loudly for the rabbits. I am seeking donated billboard space. 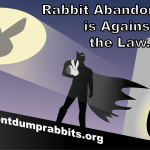 The money raised will pay for printing and placing the ad on billboards to educate that “dumping” rabbits is against the law!